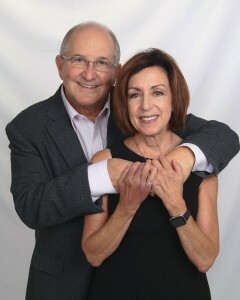 California State University, Northridge nutrition professor Terri Lisagor and her husband, Mark, will celebrate their 48th wedding anniversary this year. Their marriage is filled with respect and admiration for each other and is marked by a mutual commitment, forged while they were college sweethearts five decades ago, to leave the world a better place than they found it. To that end, the pair has arranged a planned gift to CSUN that will ultimately leave $1 million to establish an endowed scholarship for students in the Resilient Scholars Program, which serves students who were formerly in the foster youth system, and another endowment that will support faculty research, travel, and professional development in the Department of Family and Consumer Sciences. The endowments will provide future students and faculty members opportunities the Lisagors only dreamed of during their undergraduate days. Lisagor grew up in the San Fernando Valley. She graduated from high school in 1966, determined to go to college despite her family’s lack of support for her higher education aspirations. She enrolled at UCLA with dreams of becoming a teacher. Terri worked full time to pay for her education, taking a full load of courses each quarter to ensure that she graduated in the prescribed four years. She met Mark Lisagor in a freshman math class. He too was working full time to pay for his education. 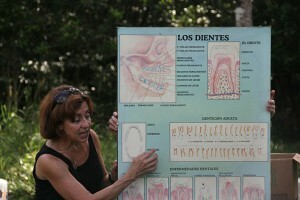 Terri Lisagor giving a demonstration on dental hygiene in Guatemala in 2013. Photo courtesy of Terri Lisagor. Among the things that drew the couple together was their shared passion for making the world a better place. While in college, they were actively involved in the anti-war movement, as well as other social causes. They lived on an American Indian reservation in the Southwest for two years, while Mark served as a dentist in the Indian Health Service. Their daughter, Kimberly, now an environmental activist and journalist, was born on the Navajo reservation. Their son, Adam, is a filmmaker in Los Angeles. Mark and Terri have two grandsons, and a granddaughter on the way. Mark established a pediatric dental practice in Camarillo and Oxnard. Terri, using her background in elementary education, established an innovative preventative dental health education program for the families in his practice. Motivated by an increased curiosity about nutrition, she enrolled at CSUN, eventually earning a master’s in food science and nutrition in 1990, and a doctorate in education from Pepperdine University in 2004. While completing her master’s, Lisagor was invited to join the faculty in CSUN’s Department of Family and Consumer Sciences as a lecturer in food science and nutrition. Once she earned her doctorate, she was hired as a tenure-track faculty member. Now a full professor and past chair of the department, she said she is delighted to continue to work with students, faculty, administration and staff throughout CSUN. Despite their professional obligations, the Lisagors continue to carve out time to volunteer. For the past several decades, Mark has worked with Global Dental Relief, leading teams of volunteers to provide free dental care for impoverished children around the world, including in Nepal, India and Guatemala. Lisagor often joins him on these trips, and frequently has included CSUN nutrition students on their teams to Guatemala to teach about nutrition and oral hygiene.